The OC Mama: Wordless Wednesday- My Whole World! ETA: Poor Jeff had been awake for all of about 30 seconds when I took this pic. He's totally being a good sport by not getting pissy that I'm posting this. And seriously, anyone who wonders where my kids get their eyelashes, check out Daddy's lashes. Cause it's not from me! Aww... I just love mornings like that! Seems like a beautiful world! I hope you'll swing by my site, The IE Mommy, to see my WW entry and to enter our photo poster giveaway! Thanks for sharing. Cute!!! 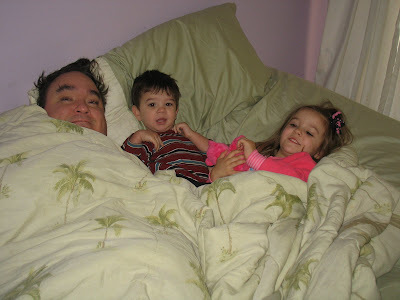 I love it when my kids get in our bed in the morning! Oh that's really sweet! What a cute photo! I have many pictures like that one. Usually, the kids are ON daddy though, not laying nice next to him. What a cute picture.